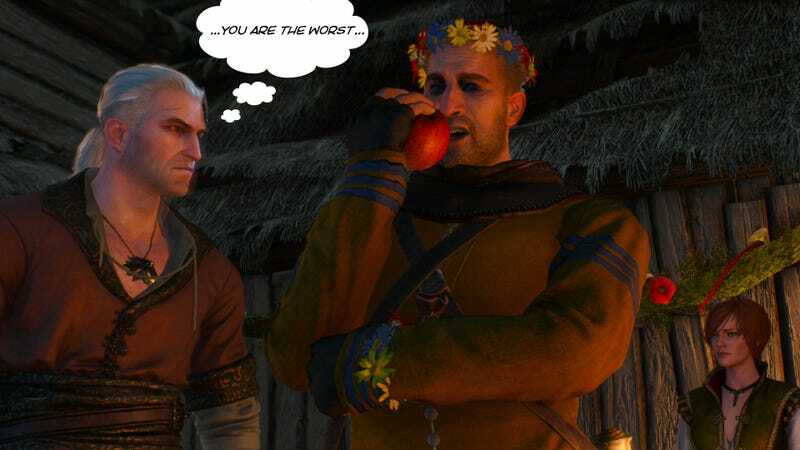 Gaunter O’Dimm, one of the stars of The Witcher 3’s expansion Hearts of Stone, is a mysterious dude. Turns out he’s also a sneaky one, hidden so well in the background of the game that even its biggest fans couldn’t find him. In October, developers CD Projekt Red ran a competition asking fans to “find the man in glass” (a nickname for O’Dimm) and take a screenshot showing each instance he’s hidden in the background. Surprisingly, not a single entrant could find every example; the winner of the competition had to be chosen from the ranks of the “close enough”. While it sounds like an easy task, one of the cool things about O’Dimm’s design is that he’s supposed to be a guy who blends into the background. Revealing himself early in Hearts of Stone to be an NPC from the main game (that you’ve of course forgotten), his face and model don’t look like those of someone who’ll turn out to actually be one of the most dangerous men you’ll face in The Witcher 3. He looks like the most common dude in Temeria. Considering the devil—which is essentially what O’Dimm is—is supposed to lurk amongst us, it was a smart move. Red eyes and horns might have been a little too obvious. Anyway, intrigued by this—and unable to find him in many places myself—I asked CD Projekt Red to send over a list of all the spots O’Dimm is lurking. You’ll find them below. And understand what I mean about him being the perfect design to blend into the background.